Well, Dan covered our experience with our first live tweet reviews, so I will leave it at that except to say follow us @cigarandwhiskey on the Twitter, like us on Facebook and tune in on Tuesdays at 8:30 if you want to get in on the action! So, on to the Bobalu Texas Select Limited Reserve. Bobalu is a cigar company based in Austin, TX that rolls its own unique blends with the expertise of several Cuban natives who decided to relocate to the states. I have a long-standing respect for the company, as Bobalu cigars were my first true entry into the world of premium cigars. I started, as many do, with a sampler pack, though due to the quality of the Bobalu brand I found each more tasty than the last and was firmly fodboldtrøjer børn hooked into the world of premium cigars. So, when I wandered into their store one day and saw a cigar labeled “Texas Select” I was enthralled. When I saw one beside it that was labeled “Texas Select Limited Reserve” I was enthralled and had a lighter pocketbook. If you followed our live tweets you have the gist of my thoughts on the cigar, but I will attempt to offer a more complete review here. The cigar has a very pleasant aroma of cedar and earth that suggests a woodsy, complex smoke. The prelight draw unveils more cedar and a distinct peppery flavor. Excited to delve into what I thought would be a savory cigar, I got toasting. The first third of the stick gives off a somewhat airy sweet grass and hay flavor that is incredibly pleasant without being in any way overwhelming. The draw is also a bit snug at this point, but nothing unmanageable. As the first third progresses it begins to deepen and increase in complexity to reveal a smooth almond. Underneath the almond flavor I can also detect the cedar that I smelled on the foot of the cigar begin to build. The second third is a progression of the first as the almond and cedar begin to build and play with each other. Then, fairly suddenly, the almond disappears. The cedar takes center stage for a moment until a trace of cayenne pepper sneaks in to create a bit of spice on the finish and retrohale. As the final third begins I am ready for a full on pepper blast. However, I am surprised as the pepper and cedar drop off almost entirely. The cigar fundamentally shifts to black coffee and hazelnut. This serves as an excellent close to the cigar. Or, I should say Billige fodboldtrøjer tilbud it would be an excellent close, except on the last few puffs I am treated to an incredible toasted marshmallow flavor. Delicious! Construction on the Texas Select Limited Reserve was excellent, with thick ash that held on until I was ready to ash it (more than 2″ at one point). The draw was a little tight for my taste into the halfway point, but opened up after that. Burn was straight and required no touchups of any kind even though the night was very windy. I picked up a bottle of Old Weller Antique right before I headed down to Padre Island. Schools of black drum spawn off Padre in late February and early March — they’re beefy creatures that put up good fights. I’d actually meant to purchase W.L Weller Special Reserve, another wheated bourbon I’d taken along to a deer hunt last December. Like the Reserve version, I can’t help but think that this bottle of Antique would also be better enjoyed in wintry weather. Even though I try to live by the mantra “smoke ’em if ya got ’em” there are certain stogies that just beg to be smoked at a special occasion. Therefore, when I recently got a new job doing about exactly what I’ve wanted to do for a few years now, I knew there were just a handful of cigars that would do the trick. Of course, the one that floated right to the top was one of the Arturo Fuente Opus X in the Fuente Fuente vitola that I’d gotten over Christmas. I knew that this was a cigar that has received both tons of praise and claims of being overrated. In addition, at the time of smoking I had only personally aged the stick for a month, far short of the recommended 1+ years recommended by most Fuente aficionados. With excitement (and a slight amount of trepidation), I made my way to the backyard to savor this popular and hard to find stick. As I’ve now noted several times, appearance is important to me, and the Opus X delivers 100% in this regard. With a beautiful mottled brown wrapper and an incredibly bold red and gold band, the Opus X demands your attention and doesn’t let go. 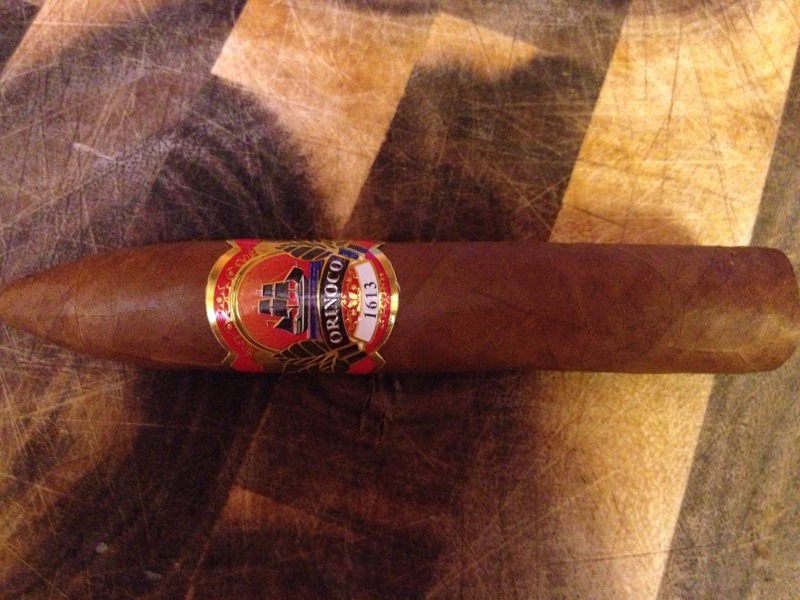 The cigar also gives off a very deep, earthy aroma with some hints of pepper. The cold draw gives more of the same and is perfectly firm. Mouth watering, I get toasting. At the first puff of the Opus X I am immediately overcome with an amazing variety of flavor. The earth and pepper from the cold draw is there, but I also get cedar and something that vaguely resembles allspice. There are also occasional bursts of very potent red pepper that seem to appear and disappear at random. We’re off to a good start and I am really enjoying the diversity of flavors. The second third starts off similarly strong but then I faced a little issue resulting in a disproportionate freak out. The Opus X just goes completely out. I humbly submit that this was no fault of my own, and there was no progression. One puff gives off a big cloud of smoke, the next…nothing. Trying not to get too worried, I relight the cigar, and after a few puffs I am back to normal. Whew. The flavors don’t really change too much, but I get more pepper and cayenne makes its appearance here. I am pleased to discover the tasty pops of red pepper continue with their surprising irregularity. The final third changes fairly substantially for me, dropping the majority of the pepper and wood and offering some rich blonde coffee. This offers a welcome sweetness to the stick and rounds off the diversity with a dessert-like undertone as the sweetness ramps in intensity for the remainder of the cigar. Satisfied, I finally put out this legendary stick. I will say that, aside from the small blip that required me to relight the cigar, the Opus X performed beautifully. A perfect burn was complemented by ample and fragrant smoke. I sincerely wish that small issue hadn’t arisen, because the Opus would have been a contender for best performing cigar I have yet smoked. Still, these things happen sometimes so I will probably write this off as an irregularity. To everyone who has held off of their Opus X collection to put a lot of age on it, I say you should try or “fresh.” That being said, I can definitely see how this will get fantastic with some serious age. I will be sure to put up a review when such time comes, but for now I can heartily recommend the Opus X and will definitely be picking these up whenever I get the chance so one day I can hopefully have a substantial Opus rotation.